KANSAS CITY, Mo. (AP) – One criticism being lobbed at Kansas City general manager Scott Pioli is that he still has not come to contract terms with punter Dustin Colquitt. 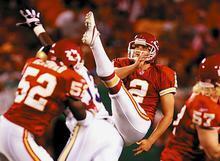 Colquitt is one of the best punters in the NFL and one of Kansas City’s best players. He says he has no plans to leave Kansas City even, though he could be an unrestricted free agent in 2013. He says there’s no friction between him and Pioli, and that he also has a strong personal relationship with owner Clark Hunt. He indicated contract talks are under way.